Members of the Achievements Discord managed to complete Glory of the Dazar'alor Raider and get the Dazar'alor Windreaver mount in less than two days after the new raid opened. 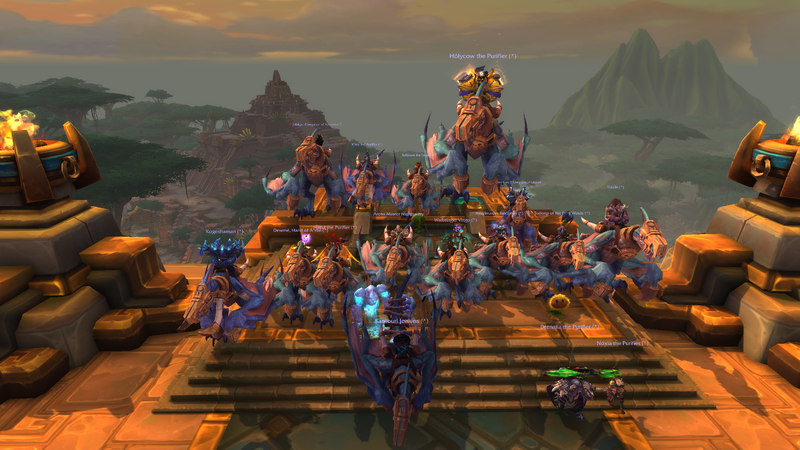 Battle of Dazar'alor opened on Tuesday and members of the Achievements Discord claimed a World First by completing Glory of the Dazar'alor Raider. Congratulations to everyone involved in getting this World First feat: Ashbone, Nightswifty, Illidjari, Hõlycow, Myzvale, Zeeldax, Mcback, Askii, Noxia, Tillie, Uguluugulu, Torionp, Dewmê, Xirev, Hailul, Koge, Samouri, Karnatron, Baran, Alfakyn, Drenaila, Vingo, Tizzle. "Thank you Blizzard for these achievements! It's been an amazing experience discovering and attempting each of them, we had a lot of fun transforming into a raptor to steal treasure, fishing up the lurker, and building a snowman. We're looking forward to more fun and challenging achievements in the future!" The meta achievements requires the player to complete specific tasks on each raid encounter, such as building a Frosty Snowmon before defeating Jaina, or fishing up "De Lurker Be'loa" (throwback to The Lurker Below from Serpentshrine Caverns). "Soaring high above the Battle of Dazar'alor, these beasts are drawn to the most cunning of victors." If you want to get the Dazar'alor Windreaver mount, join the Achievements Discord. Members are forming various achievement runs, so you can find groups that focus on Uldir ( Glory of the Uldir Raider), the dungeon achievements ( Glory of the Wartorn Hero), and more. Can I Get a Hek Hek Hek Yeah? Defeat the Champion of the Light in the Battle of Dazar'alor after stealing 3 shinies from each of the Crusaders, Disciples and Champion of the Light on Normal Difficulty or higher. Praise the Sunflower Defeat the Opulence in Battle of Dazar'alor after /praising a Singing Sunflower while under the effects of Brilliant Aura on Normal Difficulty or higher. Walk the Dinosaur Defeat the Conclave of the Chosen in the Battle of Dazar'alor without killing all the initial raptors summoned by Gonk's Wrath on Normal difficulty or higher. It's most impressive to get all of those achievements done so quickly after raid release. Big congrats to some very talented raiders!